Starring Adewale Akinnuoye-Agbaje, Heather Graham, Christopher McDonald, Jennifer Ehle, Reyna de Courcy, Celeste O’Connor, Anthony Mackie, Rob Morgan, Louis Mustillo, Tyler Elliot Burke, Sean Ringgold, Lauren LaVera, Murphy Guyer, Jake Weber, Pamela Dunlap and Lynne Wintersteller. Screenplay by Emanuele Della Valle. Directed by Emanuele Della Valle. Distributed by Abramorama. 98 minutes. Not Rated. In the mid-1970s, when casino gambling came to Atlantic City, New Jersey, it was looked at as a way to revive the once-thriving seaside resort. At the time, Atlantic City became the only city in the US to have legalized gambling outside of Nevada. Huge bright and shiny dreams of casinos, shopping, hospitals, entertainment, tourism were bit on by magnates like Merv Griffin, Donald Trump, Bob Guccione, Steve Wynn and Hugh Hefner. The city that everyone’s grandparents went to was going to be the new go-to tourist destination. However, well less than a decade later, the bloom was off the dream and Atlantic City settled into its natural habitat – a series of slum neighborhoods surrounded by increasingly run-down gambling palaces. People taking buses (only $10, and you got a roll of quarters to take to the casino, so the trip was essentially free!) to spend their social security checks and children’s college funds on the slots. Despite some occasional hills, the city planning has mostly been stuck in the valleys over the four decades since the opening of casinos. For one thing, Atlantic City was a beach town, and once the casinos opened they stopped courting the beach tourists, nowadays it’s a rarity when you actually see someone on the beach in AC. Most of the exclusive (and expensive) stores have long since closed, being replaced by ticky-tacky souvenir shops. Plus, now there are plenty of places you can gamble, including nearby Philadelphia, so why go to this old run-down town? Because of this, more than half of the city’s casinos have closed in the last few years – including the Trump Plaza, The Showboat, The Atlantic Club, the Trump Taj Mahal and Revel. As the casinos imploded (figuratively, and sometimes literally), the city has shriveled into desperation. Add damage from Hurricane Sandy – which decimated the city and neighboring towns – to that scenario, and Atlantic City and its immediate environs are turning into a ghost town at this point. Though it takes place in Atlantic City and its outskirts, Wetlands barely even acknowledges the casinos, and the only gambling going on is football gambling with old-fashioned bookies. Still, the rot that has been wearing down Atlantic City for decades is very much in evidence in this sad little morality play by the sea. 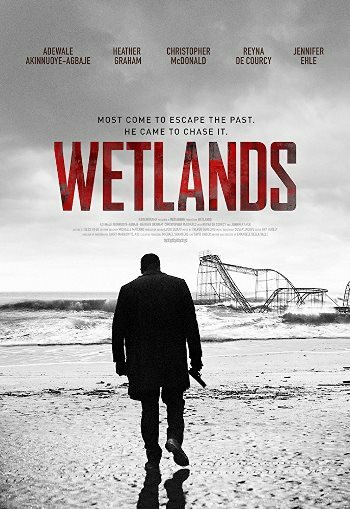 For the record, Wetlands is not nearly as good a film as Atlantic City was. Hell, it is not even quite as quietly profound and moving about the city’s decline as the Springsteen video. However, as a downbeat look at cops, criminals, hustlers and two-time losers on the fringes of a dying town, it is a pretty interesting indie drama. Adewale Akinnuoye-Agbaje plays Babs, a former Philadelphia cop who lost his badge due to a fuzzy reason having something to do with drugs and a dead suspect. He moves down to the outskirts of Atlantic City – the area is called the Wetlands, thus the title – for two reasons: to reconcile with his ex-wife (Heather Graham), and more importantly his estranged daughter (Celeste O’Connor), and also to have one last shot at working as a cop. His partner is a loud and big-hearted gambler (Christopher McDonald), who is married to the local news weatherwoman (Jennifer Ehle). He introduces Babs to a bunch of colorful underworld types. Then it turns out that Bab’s ex-wife’s new lesbian lover (Reyna de Courcy) may also be somehow involved with these low-level mob types. Babs finds graft and corruption everywhere as he struggles to keep on the straight and narrow, for his job and for his daughter. However, as a hurricane bears down on the area, everything starts to spin out of control. Wetlands is a beautifully stark film, but frankly its slightly muddled plot could use some of the bleak, gorgeous coherence of its cinematography. The melancholy, desperate mood of the film and the characters will stick with you long after the slightly cliched storyline dissipates. Tags: Adewale Akinnuoye-Agbaje, Anthony Mackie, Atlantic City, Bruce Springsteen, Burt Lancaster, Celeste O’Connor, christopher mcdonald, Emanuele Della Valle, Heather Graham, Jake Weber, Jay S. Jacobs, Jennifer Ehle, Lauren LaVera, Louis Malle, Louis Mustillo, Lynne Wintersteller, movie review, Murphy Guyer, Pamela Dunlap, philadelphia, PopEntertainment.com, Reyna de Courcy, Rob Morgan, Sean Ringgold, Tyler Elliot Burke, Wetlands. Bookmark the permalink.